My wife and I visited this desert island for an afternoon picnic and private snorkelling excursion when we visited Coco Palm Dhuni Kolhu and had a truly memorable afternoon in idyllic and romantic remoteness. An absolutely top activity. Despite being an exotic locale, the Maldives food is as high, as clean, and as safe a standard as you will find anywhere. The only food problem I have encountered in our many trips was friend who suffered an allergic reaction to the fresh pineapple. But if you are particularly fussy about such considerations, then according to the Food Safety Asia organisation, Kanuhuraa is the resort for you. 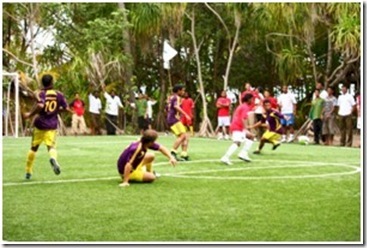 If you want to escape everything with your trip to the Maldives except beloved ‘footie’, then the most sympathetically fanatical resort is Mirihi who not only, like many, have their own football team, but also have their own astro-turf foot ball pitch. Guests are welcome to join in the games as reported by ‘librahi’ on this Trip Advisor report. Many are attracted to the Maldives for the distinctively tiny croppings of land that make up the islands. 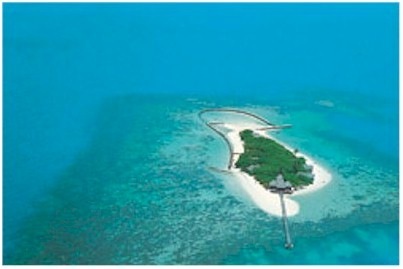 No island is big enough for an international airport near the capital of Male (so they had to create a long, rectangular strip of land out of landfill) and most can have their perimeters traversed before finishing a pre-dinner pina colada. But the grand-biddy of them all is Coca Palm Kudahithi at a mere 5,600 square metres (140 metres long and 40 metres wide – not much larger than a foot ball pitch). With a proportionately small number of rooms – 7 villas – it is the closest thing to your own secluded deserted island with a palm tree on it.